Unfortunately though, that's where they stopped.... at the sight of ONE word. They automatically switched off. I can honestly say that learning this 'vision' technique as an apprentice meant that I was open to what the world could offer me... I hope that this approach benefits you at some point in your life too, be it business or personal. 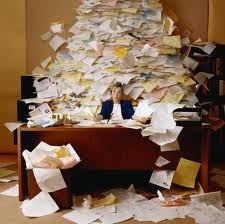 I can honestly say that for most OMB's 'organisation' can be a struggle. I mean organising your day to day activites to earn you money - that's EASY. It's what you're good at. It's WHY you decided to start your own business. To work within your own business is amazing. To manage your business is hard work. To be SO organised that the business would run without your presence...? That's another story. I fully bow down to these people who have this skill. It's something that I ensure is in the back of my mind throughout my career. No doubt these people, who I will refer to as O-God's represent their name so well. They certainly wouldn't have clicked off after the mention of an unsightly word. These O-God's have made systems and processes; 'their' glue for their business. This glue is one of the strongest business assets you can have and should sustain throughout. One of the 'glue' uses, is accounting for their business income and expenditure. Grabbing any piece of taxswag they can. The more records kept, detailing their day to day activites, the more leverage you provide an accountant to prepare your profit and loss account. In my 13 years experience, the most detailed records produce the most attractive tax deductions available. I'm yet to be proved wrong. Does your accountant do your banking?